I have a homebuilt 18' Swampscott John Dory for sale. It sails, powers, rows and is gently used. Must see to appreciate. I live in Canby and have it on Craigslist, but was curious if any in the group would be interested. Asking $5000. (Willing to negotiate some.) Have pictures. The boatshop was burglarized in early February. We are still assessing the magnitude of our loss. However we have taken some measures to assure that this will not happen again. 1. The biggest items we know were taken were the planer, the spindle sander, and the air compressor. The planer has already been replaced, but we do not have a stand for it. If anyone has a rolling stand they would be willing to donate we will be very appreciative. 3. The new lock we put on yesterday is protected by a heavy duty steel shield which should prevent anyone from getting a bolt cutter on it, or a hacksaw or grinder. Unfortunately this makes the new lock more difficult to open. Instructions will be sent out in the mail with the new combination. 4. We have installed a video surveillance system with a motion detector and infrared camera that can see in the dark. 5. We have recorded serial numbers for nearly everything that has one in the shop. 6. We have engraved our name on nearly everything, in prominent places to make the items more identifiable, and less saleable. A number of people have offered to make donations to RiversWest to help cover the losses. We do have theft insurance, but the deductible is $1000. We estimate our loss at around $1500. We have decided not to file a claim as we are worried that it would cause our rates to go up. We are also hoping to reduce our losses by finding deals on Craig's List. 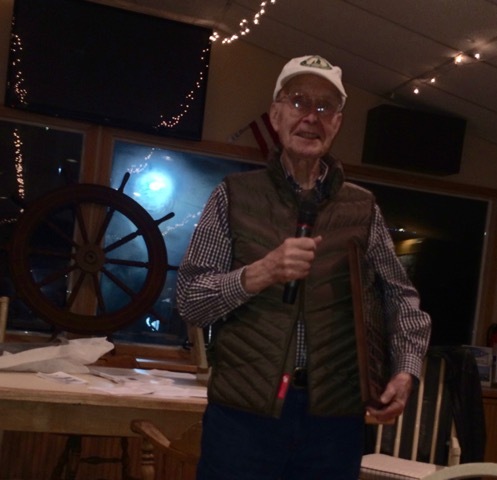 At the Annual Membership Meeting, held Jan 30 2016 at the Rose City Yacht Club, the Founders Award was presented to Jim Litton in appreciation of the generous donation of his shop tools to RiversWest. Thank you so much Jim! Dell Hambleton was given sponsorship for her replication of the Cherokee Trail of Tears trek in the form of free rent on half a bay until may 1 to complete work on her kayak. *John Whitehouse has created and distributed a form for self-evaluation of each member's skills and needs for additional training. These will be analyzed and a plan will be made based on it. Ric talked about the very positive impact on his students from the experience of building a total of 4 Salt Bay Skiffs with volunteer help from RiversWest. As in past years, we will be holding the annual Planning meeting at the Rose City Yacht Club, on Jan 30. time and details will be announced later, but the format will be very similar to previous years. Be sure to reserve the date! The Portland Boat Show will be held from Wednesday, Jan 13-Sunday, Jan 17. As always we will need volunteers for two shifts a day as well as setup on Tuesday before the show. There will be another announcement after New Years asking for official signups, but you can all be thinking about it, and holding some time during that period. 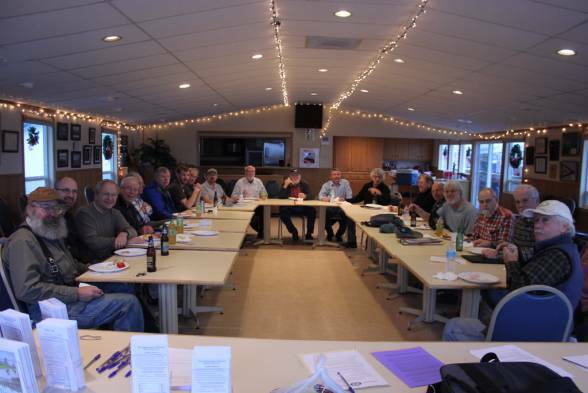 Our Annual Membership Meeting was held on Nov 22, 2014 at the Rose City Yacht Club, attended by 23 members. There was a lot of enthusiasm and lively discussion. Several main directions emerged for the next year. One goal that emerged was that we need to increase our membership. We expect to do this by placing our brochures in businesses and public buildings, contacting lapsed members to renew, and though publicity at the Portland Boat Show, Family Boat Build, and any wooden boat shows we can attend through the course of the year. In addition our expanded Workshop Program is very likely to attract new members. Related to this is our desire to increase our outreach to the public. Public outreach, and especially education, is one of the main purposes of RiversWest, according to our bylaws. Randy Torgerson has taken over and expanded the Workshop Program, with workshops and demos scheduled throughout the next year. We have had some issues in the shop with inappropriate and in some cases unsafe use of the machinery, and broken machinery that was not reported. We all agreed that we need to have written procedures for each machine that give safety rules, and the proper way to set them up. Once this is in place we will certify members to assure that everyone understands these rules and procedures. There was general agreement that we need to continue all the events we held last year and even add some, especially more on-the-water activities. This would include the Portland Boat Show, where we will have a large booth, the Family Boat Build, the Hagg Lake messabout, and the Spring Swap Meet. We have been approached by the Catlin Gable School and agreed to provide kits and mentors for them to build two Salt Bay Skiffs in 4 days in their shop. This will happen in March. On top of all this we will now be publishing our newsletter 4 times a year. The The RiversWest Annual Membership Meeting took place on Saturday, Feb 1, 2014, at the Rose City Yacht Club. In the " what do you want to do" file was several good suggestion, but one theme emerged loud and clear. LET'S GET TOGETHER ON THE WATER. various formats: picnics, regattas, overnights, etc. So let's have some volunteers for a committee to start planning some messabouts. Just let me know who you are. Remember things don't happen unless someone makes them happen. Second, I've carefully gone over all deposits and counted the number of members who paid the 2013 dues--sadly only 25 so far. We had a surge at the annual meeting , but that is a pitiful number. We all know that the club operates on a shoestring, but the last few years we've been able to say we take in a nickel more than we spend. The dues is a big part of that, as an example, our insurance bill alone is more that all the dues we collect even if 50 or more pay up. Thanks to those who paid, especially those who kicked in double the dues, and the one person who paid triple. Please, the rest of you, let's get right. The new RiversWest website is on line. It contains most of the material from the old site, plus a little bit more. Hopefully you will find it easier to, well, find things. This is a request for additional material to add to the site. This can be information from previous workshops, pictures of a boat build you did/are doing, newsletters that I am missing, interesting articles, or anything else you think would be useful to include. If you get it to me, I can add it. I know you got a message not long ago about our annual meeting, but here's another. We will meet again at the Rose City Yacht Club, 3737 NE Marine Drive, on Feb 23 at 6:00 pm. Remember the gate is monitored between 5:45 and 6:30 pm, if you come before or after, just call me on my phone ,503-334-7546 on the clubhouse phone 503-282-2049 and we will let you in. The RiversWest 2013 series of Maritime Skills Workshops will be starting up again in march. We are repeating some of the successful workshops from last year, and we have some new ones. The schedule may change as we have several ideas in process for new workshops, and when we work out the details we may try to fit them in. The cost of these workshops is minimal; we charge for materials and a small amount for general overhead. For the demos that do not require any material we charge $5.00. The people leading the workshops are all volunteers.